Page yield is the number of pages a toner or ink jet cartridge prints until it runs out of toner or ink. Each cartridge SKU has an advertised expected page yield. Page yield will affect how often a cartridge needs to be replaced. Cartridges come in multiple sizes, which mean the page yield varies. High yield cartridges can print many more pages than standard yield cartridges. The aftermarket sometimes also offers extended yield cartridges. 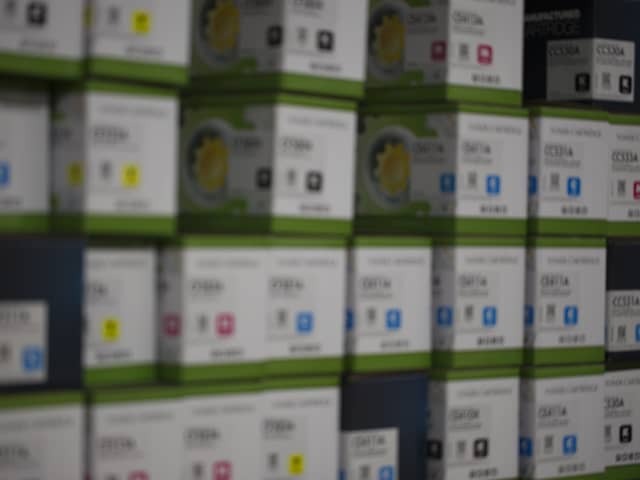 These cartridges typically print 30% more than standard or high yield cartridges sold by the OEM and lower the actual cost-per-page, but in some cases can be up to 50% more! It's important to note that there are many variables that can impact how many pages your cartridge will print. The amount of print coverage on the page printed, paper size and paper type, the printer's age - even the temperature and the humidity of the room the printer is located in - can impact page yield. Static Control’s cartridges are engineered and developed to meet or exceed the comparable OEM cartridge. There are two industry test procedures used to evaluate the page yield of a toner cartridge: ISO 19752:2004 & ISO 19798:2006. These two standards have been created to uniform the way companies test the page yield of their cartridges. However, these test procedures do not include print quality, reliability or how environmental conditions may affect page yield. ISO 24712:2007 is another standard that is mentioned in the imaging industry; it simply defines the test pages for use in the ISO 19798:2006 standard. Seeing the gaps in these testing methods, Static Control developed a series of page yield testing procedures that are similar to ISO 19752:2004 & ISO 19798:2006. Our testing is performed on both our cartridges as well as the OEM cartridge so that a direct comparison of yield is provided. When we say we meet or exceed OEM page yield, we mean it! The key difference between our testing and the ISO standards is our tests are specifically designed to evaluate print performance through the entire life of the cartridge in various environmental conditions. Our testing also includes additional test pages that allow us to identify print quality issues that cannot be identified by using the ISO Standard test pages. We require testing to be performed in controlled environmental conditions, including - but not limited to - very high and very low temperatures and relative humidity conditions. On top of all this, our testing also uses the ASTM F1856-04 (2009) standard, which is the standard to determining toner usage. Static Control is deeply dedicated to providing the industry's best cartridges that meet the needs of our customers. Our commitment to rigorous testing is just one of the many reasons we are the premium solution for cartridges and components to the imaging aftermarket. ¿ESTÁ LISTO PARA DESCUBRIR UN CARTUCHO DE REPUESTO MÁS CONFIABLE? © Static Control Components, Inc. Todos los derechos reservados en todo el mundo. En este sitio, usamos cookies para mejorar su experiencia. Al aceptar nuestro uso de cookies, usted se asegura la mejor experiencia posible y mejoras constantes.